Quilty Bits from the Blue Room: Let's Celebrate - Spring. Let's Celebrate for spring meant we were to send to our partner a stitchery that represented spring and the recipient could use it however they wished. Both Kali, my partner and myself, have been a bit snowed under of late so we agreed that we would both be happy to post our parcels a little later than the Aug deadline. Funnily enough we both ended up posting our parcel around the same time this week. I received mine yesterday and hopefully Kali will receive hers in the next couple of days. 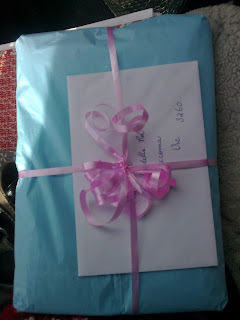 I was so excited when I received the parcel that I couldn't wait to post about it. Thank you for the gorgeous stitchery and all the extras you sent Kali. I love them all and have my thinking cap on as to what I will make to show off your lovely stitchery. These wrapped gifts above turned into this below. 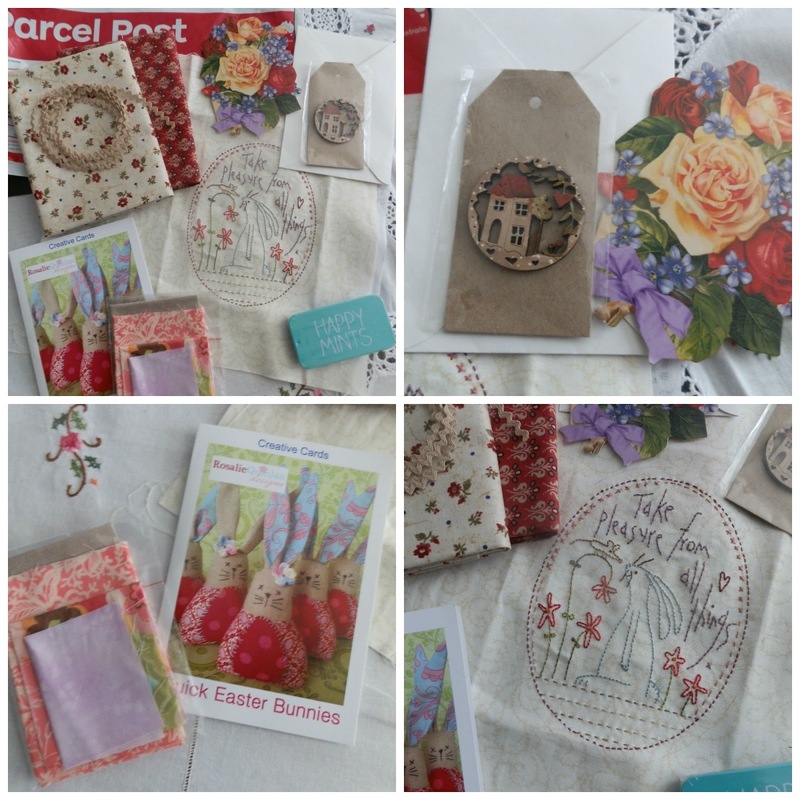 Fabrics, ric rac, Theadora Cleeve button, a beautiful spring card, a Bunny pattern and fabrics to make it, a Spring stitchery and some mints. Below is my wrapped parcel. Hope it arrives soon Kali and you enjoy my gifts as much as I am yours. Thank you for a wonderful Spring swap and thanks to Mrs Martins Quilt Shop for hosting it. Will be back to show you what I sent when I hear from Kali that the parcel has arrived. A lovely gift, everything looks very pretty for Spring. Beautiful Spring Gifts... Look forward to seeing the finished stitchery..
Lovely swap gifts Noela. Looking forward to seeing what is inside the parcel for Kali! Both gifts are beautifully wrapped and the treasures inside of yours are just lovely! Wonderful gifts, and the stitchery is so cute! Congrats! 1 Xmas Item a Month, QAL BLocks 9-12. My Sunday, Secret Santa Christmas Swap.